The above quote, from a channeling by Dr. Hannibal through Nada-Yolanda on October 11, 1968, defines the intention behind all activities, phenomena and transmissions of light by space visitors: planetary change. * In the current changeover from third to fourth dimensional frequency, man of Earth is receiving vast spiritual aid from our brothers and sisters of the Federation of Planets of our solar system. Spiritual change or transmutation has become increasingly evident during the Latter Days. 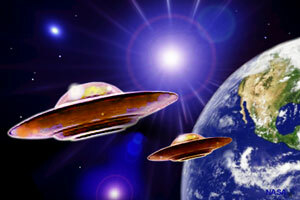 Assistance from space visitors also has become more overt during this transitional cycle. For spiritual transmutation awakens in man of Earth a new desire for and receptivity to conscious contact and exchange with visitors from other planets. In preparation for even greater activity, we call upon light workers to co-participate more actively with the spiritual space program, which is an integral phase of the hierarchal plan and program for the Second Coming. The purpose of the spiritual space program is to have those of higher planes, planets and dimensions exchange spiritual energies with man of Earth in order to help uplift him into Christ consciousness in the New Age. Consequently, our space brothers are instigating transfers of higher vibrational energies in an effort to catalyze changes in individual and mass conditions on Earth. Aboard their interdimensional and interplanetary spacecraft, the space visitors accomplish many of their tasks through use of specialized equipment called hieronics. Others in etheric and celestial realms also utilize these higher plane energies. These energy projections, as well as other space activities, do not override man’s free will. But there are certain imperatives to the rhythms and cycles of evolutionary change in this solar system that necessitate an acceleration of man’s spiritual awakening and development on Earth in these Latter Days. That is why we have experienced such rapid change on our planet in recent decades. The Earth, as the laggard in this solar system, must be brought quickly into spiritual realignment with other planes, planets and dimensions. As a unified body, our solar system must prepare to move into a new cycle of spiritual evolution during the Age of Aquarius, now dawning. “We are not here to change the world as you know it via means that would cause a reaction upon us and upon the channels who are being used to bring about this change. It would divert the attention of what is true and proper and spiritual in this, because man again deliberately would eliminate his own inner searching and his own inner change that must come about by natural processes. “Because of this principle involved, we have taken upon ourselves to exchange energies with those who are receptive to our inner plane work and have been apt instruments in receiving the vibratory frequency that is projected from actual spacecraft in the Earth’s atmosphere; and, in some cases, a little bit beyond the Earth’s atmosphere, where the equipment is capable of reaching out through the dense atmosphere of Earth and bringing about the desired energy effects. “In the process of being worked upon, the channels or the individuals, who are unconscious of the contact, bring about a frequency change within their own bodies and within their own minds, and project this effect out into the area where they are exposed. . . .
Hieronics is a type of electromagnetic force or energy used for transmuting both individuals and groups or segments of mass consciousness. Hieronic projections operate as a set of vibratory rates or energy impulses that transmute the auric field and help bring about proper alignment of man’s four lower bodies (mental, emotional, astral and physical) with the spiritual or light-body form of the Christ Self. In this transmutation process, hieronic energy projections are not harmful in any way if utilized by man of Earth with caution, discretion and pure motives for aiding the spiritual development of himself and others. As employed by those in higher planes and through use of spacecraft equipment, hieronics only can help in the upliftment of man’s spiritual awareness. Hieronics also is used for effecting changes in vibrational frequency for the Earth planet itself. Thus, devic and elemental kingdoms are influenced equally as man by these energy projections from spacecraft. Since man’s consciousness and physical body are used as a transformer or channel for this energy, much of the hieronic influence on the natural kingdoms is amplified through spiritual projections and demonstrations of light workers. As an aid to changing vibrational frequency, hieronics is a tried-and-tested technique developed by masters in this solar system over many thousands of years. Nonetheless, our spiritual receptivity and cooperation will enhance the effectiveness of its use now on Earth. Hieronics is not unknown to Earth. It was employed here prior to and during the time of Atlantis, until error conditions in that civilization forced the withdrawal of this knowledge and functioning. In the hierarchal plan since Atlantis, hieronics was not reintroduced to the Earth plane until late 1968, when the spiritual Hierarchy released the knowledge to, and began new experimentation with, Nada-Yolanda and El Morya/Mark and others of the Mark-Age Unit. Since that time, hieronic projections have played a vital role in the externalization of the Hierarchal Board and the implantation of the I Am Nation for all on Earth. Although much of the hieronic work has taken place behind the scenes or in unconscious ways, the time is rapidly upon us for more conscious participation in this activity. This will be one aspect of the many spiritual demonstrations heralded by light workers in coming years. The Hierarchy has channeled a wealth of material on the nature and the application of hieronics. Much of this information has been published in the Mark-Age text Visitors From Other Planets. By increasing our understanding of both the principles behind this electromagnetic energy, and the use of space equipment to utilize it, we as light workers can prepare ourselves better for conscious cooperation with these projections. In a channeling via Yolanda on April 28, 1969, Dr. Hannibal revealed the following information: “We have instigated an equipment that is an auxiliary to your works, efforts and energy broadcasts. This has been termed hieronic. “It is much more complex than your machinery and has within it a number of aptitudes that can guide our principal decisions. In part, and only in a reference-point example, it is similar to a highly complex computer which you utilize on the Earth. This helps us in evaluating individuals, their parts in the overall planetary development and their influence over the mass consciousness with which we are so deeply concerned, as we must be. “It is not only through such equipment that we conclude our various observations. But because of the nature in which Spirit works by lowering into a lesser activity, such as the third dimensional plane, via higher and more advanced souls such as those who are living on the etheric and the celestial planes, we are obliged to coordinate and to control and to master certain aspects that will influence you on an Earth plane dimension. This is universally true wherever you have manifested life form in groups such as you have on the Earth and in the astral planes, and such as manifests in the etheric planes also, at least in this solar system. . . .
“But until we rip the veil and until we can land the craft from other planets, we must work in this particular manner. The efficiency of it is limited. Our satisfaction with it is limited. But because we need outlets and instruments through which we can experiment and through which we can broadcast these energies and ideas, we must work within the limitations of that which is imposed upon us by the higher, more direct control of hierarchal aspects. . . .
“We have a single goal, of which I am in command. That goal is to bring about the landing of craft sufficiently into your atmosphere so they can influence and can turn the tide of events in the way of man’s thinking and understanding and development of Earth plane matter. 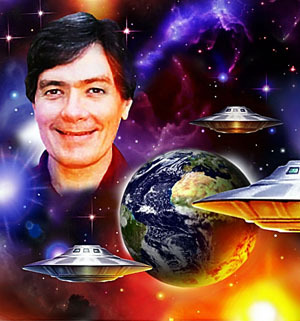 “Those of us who are advanced to handle the upper vibratory rates of this electromagnetic equipment or frequency development can transmit it down into the ethers of the Earth plane and allow you to be submitted to their radiation; if you want to call it radiation, or emanations is still a better term for that concept. . . .
“As far as the etheric form of all other life development upon the planet Earth is concerned, it too is electromagnetic in essence. The life form essence itself responds to electromagnetic energy vibration. Therefore, it can be influenced by those who come with that kind of equipment or that kind of knowledge from the higher frequencies and can influence the structure, either breaking it down or building it up, strengthening it or expanding it, or dissolving it, as the case may be. “So, you too will have to do this same thing in your own creative force when you are ready to come fully into the light-body evolvement and expression. While you are in between third dimensional form, which is your physical and personality body as it expresses now, and the light-body form, which is your I Am presence and the electromagnetic equipment you already have within yourself, you cannot do it to its fullest extent and you cannot have the mastery over it that you would like to have. 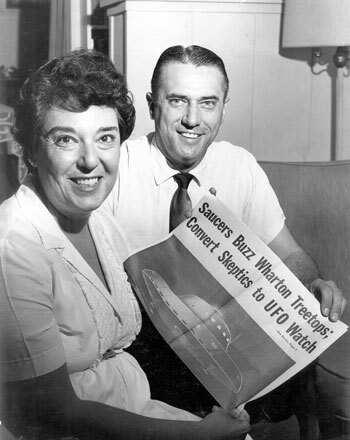 Why do space visitors need to use hieronics as equipment supplemental to their spiritual works? What considerations do they have to make in utilizing hieronics? What role does hieronics play in hierarchal decision-making? Answers to these questions are not always simple. But in numerous channelings through Nada-Yolanda by masters of the Federation, we have been given important clues to understanding their methods of operation and planning. We present some brief excerpts here. 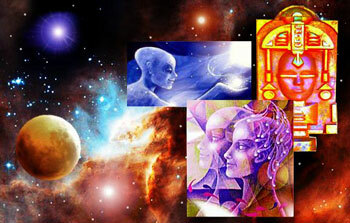 Studying the actual communications of the Hierarchy, as presented in Visitors From Other Planets and other Mark-Age publications, not only will give us a fuller perspective of hieronics but also will enable us to tap more directly into the hierarchal energy transfer that is triggered by the speech patterns and the method of transmission used in interdimensional communications. Sananda spoke of the necessity of using hieronic equipment for planning procedures in a channeling on April 30, 1970: “Many people are under the assumption that we in etheric consciousness or ascended-master guidance facilities can know and can be in every single situation completely. While this is true under ordinary circumstances of dealing with small measures of guidance, group consciousness or activities, it is not true on this large global scale of involving all the light workers, all the incarnated souls upon the Earth, the Earth planet itself on all levels, and life forms that are involved with the evolution of the planet and the race of man upon the planet in these Latter Days; also, the interrelationship between the planetary life and form with those on other spheres and other dimensions concerning Earth plane interrelating aspects. As we become receptive instruments for hieronic projections, we will be aided greatly in our I Am Self demonstrations. Let us keep in mind the following key statement from Dr. Hannibal, channeled on June 4, 1971. It is fundamental to understanding our co-participation with the spiritual space program. “Because of these transmuting qualities in the hieronic projections, we can secure the roles and the missions of those souls in the light who know and who suspect a higher plan than that which is seeming to manifest on the Earth in mortal affairs as of this time period and date. . . . In studying the applications of hieronics for transmutation, our focus must remain on the light. For it is only by concentrating steadfastly on positive results — in other words, our resurrection into the light — that we are able to pass successfully through the various trials and crucifixions we face on our journey to I Am Self expression. During the Latter Days, mankind and all life forms on Earth are experiencing great spiritual influxes of light for planetary change. During this cycle, our emphasis primarily centers on Sixth Ray activity: cleansing and purifying mortal, third dimensional consciousness, and resurrecting into fourth dimensional or Christ consciousness and powers. In order to manifest spiritual changes and transmutation smoothly and effectively, the Hierarchy has instructed us to focus on resurrection into the light. This holds true also in working with hieronic energy projections, which effect transmutation. Affirmative and assertive action is required by all light workers who desire to tap into and to be influenced by hieronics. For we must put to use the training we have received in basic metaphysical principles for right thought and action. Therefore, in the midst of sometimes horrendous cleansings in these Latter Days, we must hold our attention on positive new images of light for ourselves and our planet. As we focus on positive changes for the highest good of all life forms, we can make ourselves receptive to hieronic energy projections from our teachers in higher planes and via specially equipped spacecraft. Their projections amplify our new images of light and help raise the spiritual force field of the planet. Denial and elimination of error patterns is a valid metaphysical technique we can use to work on personal and group cleansings. (See Mark-Age text How To Do All Things, Chapter 6.) But when we tune in to hieronic projections for spiritual upliftment, we should concentrate predominantly on affirming, and visualizing the manifestation of, light. For hieronics amplifies our spiritual projections, so that what we focus upon in our thoughts and desires tends to be empowered and attracted to us. Therefore, let us visualize positive implantations of light for ourselves and others. At all times we must maintain pure motives of selfless love and service to help insure transmutation that is beneficial to individual and mass conditions on Earth. In this manner, we also cooperate most effectively with the space phase of the hierarchal program. Through channelings received by Nada-Yolanda, the Hierarchy has given us general insights into the applications of hieronics, but many specifics still are unknown to us. Yet, the Hierarchy has told us many times that we always are given sufficient information for understanding how to coordinate our spiritual missions with those of our teachers who plan and guide the hierarchal program from higher realms. Moreover, much of the technical data relating to hieronics undoubtedly is beyond our current scientific capabilities, as well as our current spiritual responsibilities or needs to know such, until we achieve further spiritual development on Earth that will allow us to receive more information. Therefore, we must glean what knowledge we can from both the esoteric and the technical information already channeled, but at the same time we must hold fast to the spiritual intent for which these guidelines are revealed to us. The purpose of the Hierarchy, in revealing this information, is not that we should seek to dictate or to manipulate hieronic projections — which is their rightful function, not ours — but that we should bend all our efforts to be receptive and clear channels in cooperating with this assistance. 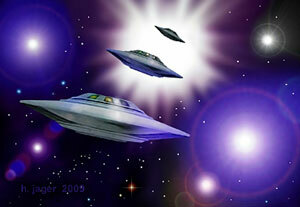 Many aspects of space activity are associated with the use of hieronic energy and equipment. By becoming aware of some of the major applications, we may understand better how we can prepare mankind of Earth not only for the rise in vibratory frequency but also for increased contact with visitors from other planets. Following are some of the basic applications of hieronics. Understanding these will help broaden our perspective on the use of this energy for our own transmutation and light-body amplification. DATA GATHERING & MONITORING. This involves specialized equipment for reading and testing thought temperatures or atmospheres of both mass consciousness and individuals, including psychic, mental and emotional reactions of man of Earth to new areas of energy input and spiritual growth. Such information read from the auric fields of individuals and groups is fed into complex computerlike devices for processing. Space masters use this information in their planning and decision-making. For instance, such data helps them determine what spiritual energies to project where, when and to whom, for the greatest impact and spiritual benefit to those involved. Also, based on our spiritual awareness and receptivity, space visitors can determine how fast we are able to change, and by what methods such change can be fostered for the greatest good of the whole. 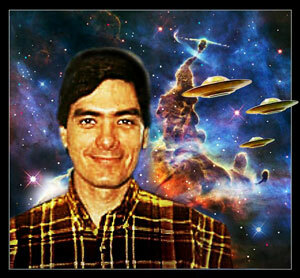 INTERDIMENSIONAL & INTERPLANETARY COORDINATION. In using hieronic equipment, hierarchal masters take many plans and activities into consideration, not just for the spiritual program as it relates to Earth but also as it relates to the entire solar system. The Hierarchy has a holistic view of our solar system and galaxy, with which Earth’s spiritual evolution is interrelated. Therefore, masters use hieronic equipment to help coordinate interdimensional and interplanetary energies — for example, etheric with astral with physical planes — so that what they project into Earth is in harmony with evolutionary growth in the whole solar system. What is effected on Earth must coordinate with proper rhythms and cycles of spiritual change in the entire solar system. COORDINATION IN ASTRAL PLANES. Since the Earth’s astral planes equally are involved in our present planetary change of frequency, space visitors also do much hieronic work in those areas. Joint transmutation of the astral and the physical frequencies of Earth is essential to bring the planet into a new stage of spiritual expression. HIERONIC PROJECTIONS TO NATURAL KINGDOMS. Space visitors work hieronically with devic and elemental kingdoms of Earth to help them accept the change in vibration from third to fourth dimensional frequency, and to help alleviate the stress of this change. This includes working with plant, animal and mineral kingdoms of the physical plane. Thus, the space brothers are concerned with conditions that could predispose major upheavals and catastrophes, such as earthquakes, adverse weather patterns and so forth. Their hieronic projections help mitigate or stabilize such conditions. Since man is a channel or broadcasting unit for this energy, changes in the elemental components of his lower bodies are reverberated also to devic-elemental kingdoms. Light workers thus play a direct role in helping to transmute lower kingdoms. Hierarchal masters project hieronic energies to aid man in specific areas of transmutation and light-body anchoring. Yet, since our Christ Self oversees our transmutation, hieronic projections serve not to control but to supplement the spiritual works of our Christ Self. For example, hieronic projections help accelerate changes in our four lower bodies (mental, emotional, astral and physical). They help awaken and stimulate certain spiritual centers or chakras, effect healings, and restore alignment of the four lower bodies with the Christ or light body. Much of this is done through hieronic amplification of our light-body projections. We achieve our most effective transmutation when we work from the light-body consciousness. As discussed previously, the electromagnetic energy of hieronics corresponds to the etheric essence of all life form, which also is electromagnetic in nature. Thus, there is a corresponding link or resonance between hieronic energy and man’s etheric or light-body form. “You will have the ability to project your thoughts to us, on the higher craft and in the higher atmosphere, who can help to condense that light body and to bring into effect the light body’s energy on the Earth in order to dissolve or to transmute the debris or pollution that now exists in the Earth planet. . . .
“When the spacecraft, anchored over your area . . . projection occurs, you will have in your own consciousness greater extension or expansion of the energies which you are developing consciously and purposely as spiritual beings. . . .
Amplifying the light body via hieronics helps stimulate transmutation in the four lower bodies. In her meditation and contact experiences, Yolanda received various clues as to how such can occur. Following are a few examples taken from Visitors From Other Planets, Yolanda’s first-person account of contact experiences with space visitors. On December 22, 1970, Yolanda received in meditation that the electromagnetic beam projected from spacecraft would change radically the auric field, which in turn would change the physical body. From our understanding of metaphysical healing principles, we know that many changes that manifest in the physical body occur first in the auric field. The auric field consists of mental, emotional and astral bodies. Transmutation of the physical occurs gradually. Masters using hieronics seek to raise our spiritual vibrations without disturbing our physical equilibrium beyond our ability to operate normally on the third dimensional plane. This does not mean we will not experience temporary discombobulation or upset at times on mental, emotional, soul or physical levels as we anchor the light body. Those in higher planes and on spacecraft gauge our balance on several levels of vibration, so they strive to obtain the greatest long-range benefits when they assist our transmutation. Despite temporary maladjustments we may experience, hieronic projections are supplementary energies that equalize desirable rates of vibration in the auric field, thus helping offset shortages or debilitations. This in turn influences physical balance, healing and transmutation, and helps bring about expansion and purification of consciousness. Purification is essential, since the human body and consciousness are used to amplify and to broadcast this energy. As test cases, we transfer hieronic energy projections into mass consciousness for acceptance and assimilation by others. So, as we work on our personal transmutation and expansion, we never must lose sight of the fact that we are forging a path for others and are serving as examples for the transmutation of all mankind on Earth. “You are transmuting that physical into the etheric form gradually, slowly, step-by-step, without shocking the physical manipulations and physical functioning. That is why chemical changes are taking place. So, many disturbances to the emotional, mental and physical conditions result. It is a major part of the demonstration and the gradual unfoldment. It must be done in this manner. “When the etheric energies and the hieronic projections come to the point of being stronger or more manifest than the physical vibratory rate, there is a subtle shift of energy and vibratory rate to the physical. This affects all of your equilibrium, in that you are accustomed to the physical relationship with the environment and the other forms of life with which you deal on a daily, constant basis. It is what you might call, in radio or visual parlance, slightly out of synch. Which actually is true; you are slightly out of the synchronization of the physical vibratory rates, and forms in those rates, and are not adjusting to and not relating to them in the manner in which you had been accustomed. . . . Whether or not we are conscious now of receiving hieronic energy projections, or we become so in the future, we still can express to Spirit our desire to make use of this invaluable assistance. The space brothers and others who are manipulating this energy seek only to serve our highest good. This good is the spirit within us, our I Am Self, which is prodding us onward into new levels of spiritual expression as sons of God on planet Earth. Yet, before we give ourselves to this experience and the beneficial transmutation that will ensue, let us make sure we approach this opportunity with the right attitude. Following are three key points we should remember. 1. Be receptive to Spirit’s will. Those masters, teachers and coworkers on higher planes and dimensions who utilize hieronics do so with the full knowledge and control of their Christ Selves. They are united with the will of Spirit as it expresses through them and for the program of spiritual evolution in our solar system. They also are united with our Christ Selves and the spiritual works we are endeavoring to externalize for the upliftment of mankind on Earth. Therefore, as we unite with our Christ Selves, we unite automatically with the hierarchal agents who are assisting us with hieronic energy projections. In this unification, we should hold foremost the thought and desire that Spirit’s will be done. Spirit’s will works equally for the good of all. With this as our first step, all that we are given to do in linking with hieronics will serve the one hierarchal plan and program in the best time and way. 2. Let Spirit select your role, outline your function. Spirit determines our roles and missions, and assigns them to us. We should not seek, therefore, to outline from the conscious level our or another’s functions regarding hieronics. This is not to say we should try to limit the way in which Spirit reveals this information to our conscious mind, for Spirit has many methods and agents for doing so. But only through intunement with our Christ Self will we have revealed to us the proper way to serve. Though we desire to link with hieronic projections and to be used as channels by the space brothers, we cannot determine the time, the manner or the circumstances by which we will receive contact. This is up to Spirit as the guiding force both for ourselves and for those who coordinate hieronic relays from higher realms. Therefore, open yourself in full measure to the design Spirit has for you. Perform the works given to you, knowing they are of benefit to all. Realize, too, that being a receptive and clear channel for hieronic energies does not mean you always will be aware of the ways you are used, since contact ofttimes may occur on unconscious levels. If our conscious participation is necessary, we shall be alerted. 3. Do not try to anticipate hieronic plans and activities. Though we should be receptive to hieronic assistance and transfers of energy, we should not try to anticipate the needs and the desires of those in higher planes. For we cannot foresee the many intricate plans they must outline for themselves, or the areas in which they need to concentrate their power projections. Moreover, it is not always feasible for our space brothers and sisters to inform us of the significance of their hieronic projections through us. But they can do so when necessary and desirable. So, allow those in higher planes their rightful functions; in their respect for our roles, they do nothing less for us. As we each shoulder our given responsibility, together we shall manifest a cooperative multidimensional effort for lifting Earth. As long as we seek only to serve Spirit, we can learn to perform our necessary functions in everything we think, feel and do. To serve in this selfless, Christlike manner must be our only goal in co-participating with hieronic projections. As we so give of ourselves, much will be given to us. This is cosmic law. * Dr. Hannibal is a code name for St. Germain, Chohan of the Sixth Ray of Transmutation. In his hierarchal functions for the space program, he is in charge of coordinating all space activities in the Western Hemisphere. Summalt, who incarnated as Peter, the disciple of Jesus of Nazareth, holds the same function for the Eastern Hemisphere. ** On June 5, 1971, Dr. Hannibal channeled: “We ask that you meditate upon, and recognize here, some subtle facts we wish to relay to those who will be involved in the forefront of teaching and of demonstrating hieronic principles on the Earth plane at this time. That which is of the affirmative is preferred. Nevertheless, that which is of the negative must be taken into consideration, but as a lesser role and function. “Hieronics is purposely being withheld from the Earth planet manifestation at the present time because this balance is not achieved yet in men’s minds and because, unfortunately, the majority of those who would be given the information would use this extremely sensitive and highly effective power to work upon negative conditions, or use the negative polarity of the denial or elimination processes of this power instead of working more firmly and conscientiously with the empowering of, the instilling and implanting of, the positive, higher and affirmative activities. Revision of articles of the same title by Phillel, published in MAIN magazine in 1983. The author extends grateful acknowledgment to the extraordinary Australian artist Hartmut Jager for his magnanimous permission to use his inspiring artwork to illustrate this article, as listed below. 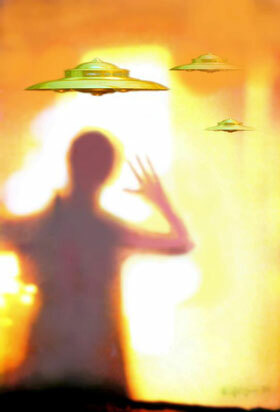 Photos: (1) Three UFOs © by H. Jager. (2) Visitors © by H. Jager. (3) Alien UFOs Yellow © by H. Jager. 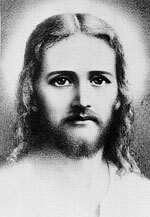 (4) Sananda/Jesus, Mark-Age Archives. 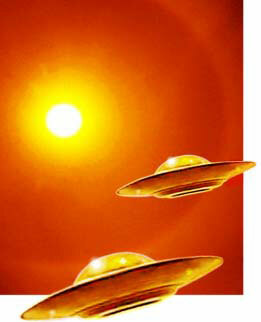 (5) Two Golden UFOs © by H. Jager. (6) Nebula Collage © by H. Jager. (7) Nada-Yolanda and El Morya/Mark, 1967, Mark-Age Archives. (8) Phillel, 1993, Mark-Age Archives (collage by H. Jager). Woohoo! Awesome post and very, very timely information to put out there to the world right now. Still reading through this post, but it’s really great! Excellent info that serves as a way to really sharpen my focus. Thanks! My son is reading your blog with great interest, Phillel, as I forward some to him and gradually, more. We discussed hieronics today very generally, and I think he’ll really learn a lot from this comprehensive article. Thanks so much! This is a very informative and helpful post. This practice will be integrated into our meditation ritual for the Pride of Olympus! Thank you, Hercules, for your loving cooperation and coordination in the Hierarchy’s hieronic network of light to help raise planet Earth into the fourth dimension.